1. Helen Simonson, The Summer Before the War — A lovely, character-driven novel about romance and politics in an English village in the months leading up to World War I. My mini-review is here. 2. Alice Tilton, Beginning with a Bash — A Golden Age mystery that feels like a screwball comedy, complete with fast-talking dames and gangsters galore. My mini-review is here. 3. Lucy Parker, Act Like It — An utterly charming contemporary romance that has me impatiently awaiting Lucy Parker’s next novel (which fortunately comes out in February!). My review is here. 4. Maggie Stiefvater, The Raven King — A fitting conclusion to the wonderful and unique Raven Cycle, which contains a surprising number of Owen Glendower references for a young adult series. My mini-review is here. 5. V.E. Schwab, A Darker Shade of Magic — A compelling fantasy novel with a fascinating premise (parallel universes with varying degrees of magic) and well-fleshed-out main characters. I can’t wait to read the sequels! My mini-review is here. 6. Genevieve Cogman, The Invisible Library — Another great fantasy premise: there are an infinite number of universes whose only point of connection is an invisible central library that collects and preserves the literature from each world. My review is here. 7. Jacques Philippe, Interior Freedom — A short but powerful work about letting go of anxiety and trusting in God. This was the book that most deeply affected me this year. My review is here. 8. Georgette Heyer, Envious Casca — One of Heyer’s best mysteries, combining her trademark wit and character development with a top-notch murder mystery. My mini-review is here. 9. Emma Mills, This Adventure Ends — An excellent YA contemporary that’s all about friendship, with a bonus adorable romance. My mini-review is here. 10. David D. Levine, Arabella of Mars — Jane Austen meets Horatio Hornblower in space! My mini-review is here. I really enjoyed coming up with my list for this week’s Top Ten Tuesday topic, which is books that you’ve recently added to your TBR list. A ton of new and not-yet-published books have caught my eye recently, and apparently I can’t get enough of fantasy or romance (or both)! 1. Jessica Cluess, A Shadow Bright and Burning — Gillian at Writer of Wrongs loved this one, and from what she says, I think I will too! It’s magic plus Victorian London plus boarding school plus apparently a ton of banter and romance…this is relevant to my interests! 2. Jenn Bennett, Alex, Approximately — Hold onto your seats, because this book is a YA retelling of You’ve Got Mail! Obviously I am here for it…just bummed that I have to wait until April 2017! 3. Megan Whalen Turner, Thick as Thieves — The Queen’s Thief series may be marketed as middle grade, but it is, without qualification, some of the best fantasy I’ve ever read. There hasn’t been a new book in years, but book #5 is finally coming in 2017! They’ve changed the cover art, which is unfortunate, but I can’t wait to get swept up in the world of this series again. 4. Katherine Arden, The Bear and the Nightingale — This book was being offered as an Early Reviewer book on LibraryThing, and the premise intrigued me immediately. It’s a historical fantasy retelling of a Russian folktale, and it looks like exactly the type of dreamy, gorgeous fantasy that I like to sink my teeth into on a winter’s night. 5. Ashley Poston, Heart of Iron — Here’s the summary of this one, from the author’s Tumblr: “Pitched as Anastasia meets Firefly, it’s the story of an orphan girl raised by a band of space pirates who discovers the truth about her origins when she and her android best friend get wrapped up in a political conspiracy.” PITCHED AS ANASTASIA MEETS FIREFLY! 6. Stephanie Burgis, Congress of Secrets — A romantic fantasy novel set during the Congress of Vienna, you say? And it’s been blurbed by the likes of Zen Cho, Martha Wells, and Juliet Marillier? You better believe I already bought my own copy! 7. Stephanie Scott, Alterations — Another YA contemporary retelling of a beloved movie. In this case it’s Sabrina, the lovely romantic comedy starring Audrey Hepburn and (of all people) Humphrey Bogart. Seriously, if you haven’t seen this movie yet, you need to! I’m intrigued to see how well the story will translate to a modern setting. 8. Lucy Parker, Pretty Face — All I know about this one is the very brief summary from Goodreads: “It stars a bombshell and a curmudgeonly—but deadly handsome—theater director.” You had me at curmudgeonly. But seriously, I enjoyed Parker’s previous book Act Like It so much that her follow-up would be on my autobuy list no matter what! 9. Kate Parker, Deadly Scandal — First in a mystery series set in 1930s London. It’s a formula I’m unable to resist! So, what other books should I be adding to my TBR list? What’s new to your queue? 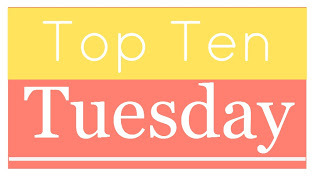 Since the fall TV season is coming up, this week’s Top Ten Tuesday is all about television! As someone who watches more than her fair share of TV, I had no problem coming up with a list of ten TV shows I’ll be watching this fall. I’ve even limited my list to shows that will be airing new content in the fall, not old shows that I plan to binge-watch on DVD or Netflix! 1. Conviction (season 1), September 19, ABC — To be honest, the trailer doesn’t do a lot for me, and I’m kind of over case-of-the-week procedurals in general. On the other hand, I loved Hayley Atwell so much in Agent Carter that I’ll give the benefit of the doubt to any show she’s starring in! 2. The Good Place (season 1), September 19, NBC — I’m super excited for this new half-hour comedy, and my reasons are threefold. First, it’s created by Mike Schur, who worked on The Office and co-created Parks and Recreation and Brooklyn Nine-Nine (ahem, see below!). Second, it stars Kristen Bell, who was Veronica Mars, nuff said. And third, one of the writers is Demi Adejuyigbe, who co-hosts the brilliant Gilmore Guys podcast. A show with this many awesome people involved is a show I need to watch! 3. Brooklyn Nine-Nine (season 4), September 20, FOX — I mean, for this alone. 4. New Girl (season 6), September 20, FOX — I love the specific weirdness of the characters on this show. The individual episode plots are very hit-or-miss, and poor Winston is basically a grab bag full of crazy at this point…and yet, Nick Miller ranting will never not be funny. 5. This Is Us (season 1), September 20, NBC — I don’t really know what this one is about, but it stars Milo Ventimiglia, and I have a lot of Gilmore Girls nostalgia right now, so I’ll give it a try! 6. Pitch (season 1), September 22, FOX — The premise of this one caught my eye: the protagonist is the first female pitcher in major league baseball. I don’t care about sports, but I tend to love sports-related movies and TV shows (hello, Friday Night Lights!). 7. Poldark (season 2), September 25, PBS — I love a good costume drama, and the gorgeous footage of Cornwall makes Poldark especially pleasant to watch. 8. The Durrells in Corfu (season 1), October 16, PBS — Yup, I sure do love a good costume drama! 🙂 And this one looks quite funny and charming. 9. Crazy Ex-Girlfriend (season 2), October 21, CW — I was skeptical of this show at first, but I’m so glad I decided to give it a try because it is BRILLIANT! I can never decide which musical number is my favorite: this boy band homage, this Fred-and-Ginger routine, or this up-tempo number about a…personal ailment. 10. Gilmore Girls: A Year in the Life, November 25, Netflix — YOU GUYS, THE GILMORE GIRLS REVIVAL IS COMING!!! Gilmore is my all-time favorite show, despite some rocky episodes (okay, seasons) near the end. I’m really excited that it’s coming back–helmed, as it should be, by Amy Sherman-Palladino–and can’t wait to see what all my beloved characters have been up to! 1. Edgar Allan Poe, “The Purloined Letter” and “The Murders in the Rue Morgue” — Technically these are short stories, but Poe is, according to the Poe Museum website, “widely acknowledged as the inventor of the modern detective story.” Both of these stories are notable for their surprise endings, although the solution to “Rue Morgue” would be considered insulting by most contemporary mystery lovers! 2. Wilkie Collins, The Moonstone — This one is remarkable for its use of mutliple points of view to describe the crime, the theft of a valuable jewel. It also exemplifies the sensationalism (and, unfortunately, Orientalism) typical of some 19th-century British literature, but it’s still a very compelling and suspenseful story. 3. Sir Arthur Conan Doyle, The Memoirs of Sherlock Holmes — Obviously this list wouldn’t be complete without some Holmes and Watson on it! I picked Memoirs, even though it’s not the first collection of Sherlock stories, because it contains some of the canon’s most notable moments, including the introduction of Mycroft (“The Adventure of the Greek Interpreter”) and the dramatic confrontation with Moriarty (“The Final Problem”). 6. Anthony Berkeley, The Poisoned Chocolates Case — I don’t remember how I first came across this book, but I do remember my utter delight upon finishing it! This novel is a perfect example (and send-up) of the mystery tropes and conventions that, in 1929, had already become popular enough to satirize. Six armchair detectives each propose a solution to a murder, and each of them is amazingly plausible and clever (although, of course, only one is correct)! 7. Vera Caspary, Laura — I had to include a noir crime novel on the list, and while I could have gone with The Maltese Falcon or The Thin Man, I decided on Laura for the purely subjective reason that I really love the movie! But the novel is quite clever as well, and it uses the Wilkie Collins-esque technique of multiple narrators, some of whom are not exactly reliable. 8. Something by John Dickson Carr — Here I must admit with shame that I actually haven’t read anything by John Dickson Carr, despite his prolific career spanning the 1930s to the 1970s. But he is generally acknowledged to be the master of the “locked room” or impossible crime, a genre that has proved to be both popular and long-lasting. 9. Maj Sjöwall and Per Wahlöö, The Laughing Policeman — Scandi-crime has become popular in recent years, but in the 1960s, Sjöwall and Wahlöö were among the first Scandinavian mystery writers to gain fame in the US. This novel, an installment in the Martin Beck series, deals with a mass shooting on a public bus where one of the victims is a policeman. It’s a wonderful procedural that realistically describes the routines, the tedium, and the false starts that plague real-life criminal investigations. 10. Luis Fernando Verissimo, Borges and the Eternal Orangutans — Possibly the strangest book on the list, this novel is an homage to Edgar Allan Poe by way of Jorge Luis Borges. It’s hard to describe without giving too much away, but it’s very clever and a very quick read! Mary Stewart, The Stormy Petrel — I really like her novels of romantic suspense, and I haven’t read this one yet. Robert Barnard, Corpse in a Gilded Cage — Give me ALL the English country house murder mysteries! Malcolm Pryce, Aberystwyth Mon Amour — I’ve had the sequel, Last Tango in Aberystwyth, for a really long time, but I still haven’t read it because I needed to get my hands on this one first! Charles Kingston, Murder in Piccadilly — I’m a bit bummed that this is an ARC rather than a finished copy, but I can’t pass up a mystery released by British Library Crime Classics! Thomas Pynchon, The Crying of Lot 49 — I’ve been meaning to read this one for a while, and it was only $1, so why not? Anne de Courcy, The Fishing Fleet: Husband-Hunting in the Raj — I don’t know much about the British Raj, but what little I do know is fascinating! Can’t wait to learn a bit more about the “fishing fleet”! Ruby Jackson, Churchill’s Angels — Obviously I am not going to pass up a book about female pilots during World War II! Caroline Stevermer, A College of Magics — I think I’ve read this one before, and I honestly don’t remember too much about it. But the fact that Stevermer co-wrote Sorcery and Cecelia, one of my favorite historical fantasy novels, means that I have high hopes for it! Stella Gibbons, Westwood — After Cold Comfort Farm, Stella Gibbons has my allegiance for life. Erin Bow, The Scorpion Rules — I remember reading some good reviews of this one when it came out. The plot seems to involve a lot of political intrigue — the protagonist is a royal hostage — which is never a bad thing in my book (pun intended)! Lauren Morrill, The Trouble with Destiny — I thought Meant to Be was really cute, and this book seems to center around a high school band. My dorky trombonist heart couldn’t resist! Patricia C. Wrede, The Enchanted Forest Chronicles — How have I not read these yet? I don’t know, but I’ve really enjoyed Wrede’s other books, so I’m sure this series will be great as well! 1. Ruta Sepetys, Salt to the Sea — I already have this one checked out from the library. I’ve only heard good things about it, and I love a good World War II novel! 3. Jacques Philippe, Interior Freedom — I’ve been meaning to read this book for a while, and Lent seems like the perfect occasion. I really loved Fr. Philippe’s Time for God, so I’m confident that I will find this book equally edifying. 4. Cindy Anstey, Love, Lies and Spies — Regency romance plus “fake relationship becomes real” plus spies plus gorgeous cover? This book checks ALL my boxes, y’all! 5. Jen Chaney, As If! : The Oral History of “Clueless” As Told by Amy Heckerling, the Cast, and the Crew — “Clueless” is one of my all-time favorite movies, so obviously I need to read this! Luckily, a friend of mine owns it and was willing to lend it to me. I MAY even give it back to him at some point! 6. Ernest Hemingway, A Moveable Feast — Another book I’ve been meaning to read for a while, and I think it would be nice to read it in April. Who doesn’t love Paris in the springtime?! 7. Morgan Matson, The Unexpected Everything -— After Amy and Roger’s Epic Detour and Since You’ve Been Gone, I think Morgan Matson is officially on auto-buy status. Can’t wait to read this May release! 8. V.E. Schwab, A Darker Shade of Magic -— I’ve been seeing LOTS of buzz about this one, and it looks really good! I think this is one of the books I’m most eager to read right now. 9. Laura Esquivel, Like Water for Chocolate — This book has been on my radar for a while, but I was never really convinced to read it until I saw a review comparing it to Sarah Addison Allen. SOLD. 10. Kristan Higgins, If You Only Knew — I love Kristan Higgins, and this is her only book that I don’t yet own. I will be rectifying this situation soon! 1. Naomi Novik, Uprooted — Every once in a while, you come across a book that feels like it was written especially for you. For me, Uprooted is one of those books. From the plucky heroine to the gorgeous setting to the romance to the wonderfully nuanced depiction of female friendship, I loved basically everything about this book. My review is here. 2. Zen Cho, Sorcerer to the Crown — It’s probably obvious by now that I will read anything that can be described as “Georgette Heyer plus magic.” This book is a fantastic addition to the genre and features two underdog protagonists: a Sorcerer Royal who is ostracized for his African descent and a woman whose magical abilities are much greater than is socially acceptable for young ladies. I haven’t gotten around to reviewing this one yet, but trust me, it is an utter delight! 3. Mary Doria Russell, Epitaph — Although I don’t usually read Westerns, I absolutely loved Doc when it came out, so naturally I had to check out the sequel as well. Russell has a gift for making the legendary figures of the Old West seem like living, breathing people. My review is here. 4. Jandy Nelson, I’ll Give You the Sun — This is a stunningly written contemporary YA about art and guilt and family relationships. While there are multiple romances, the heart of the book is the relationship between twin siblings Noah and Jude and how it changes as they both grow up. My review is here. 5. Genevieve Valentine, The Girls at the Kingfisher Club — This is one of the most unique fairy tale retellings I’ve ever read, setting “The Twelve Dancing Princesses” in the jazz clubs and speakeasies of 1920s Manhattan. Lovers of historical fiction and/or fairy tales should definitely check it out! My review is here. 6. Jean Webster, Dear Enemy — If you enjoy epistolary novels and old-fashioned romance, you’ll be absolutely charmed by this book about frivolous Sallie McBride and how she comes into her own by becoming an orphanage administrator. My review is here. 7. Lauren Willig, The Other Daughter — I’m a big Lauren Willig fan, and this is my favorite of her standalone books, set in England in the 1920s. My review is here. 8. Heather Demetrios, I’ll Meet You There — Another excellent YA contemporary novel about a girl and a boy who are both trying to escape life in their dead-end small town. Additionally, the hero has lost a leg in Afghanistan and is struggling with both physical and emotional scars. My review is here. 9. Sarah Addison Allen, First Frost — Let’s face it: any Sarah Addison Allen book is probably going to end up on my best-of-the-year list. This wasn’t my favorite of hers — I don’t think Garden Spells particularly needed a sequel — but it was still a lovely, magical read. My review is here. 10. Ellie Marney, Every Breath — I couldn’t resist this Aussie take on Sherlock Holmes! James Mycroft is a volatile genius with a penchant for getting into trouble; Rachel Watts is his best friend (and maybe more), who becomes his voice of reason and his partner in solving a murder. I’ve already got the second book in the series on my shelves! My review is here.